Now, I know the cat sees nothing wrong here, but hey – humans? Help me out here. Should not the CHILD be in the BED?! Oh. Well. Gee whiz. Wouldn’t want to bother the cat. Heaven forbid. After all, sleeping all day on my bed must be absolutely exhausting for her. Good gracious, yes. Absolutely, the child should be sleeping in her closet so as not to discomfit the cat. I woke up in the middle of the night last night to discover the cat (13 lbs) had over half the bed and I (>130 lbs) was sleeping diagonally around him. He mewed when I shifted him over so that I could at least lie straight. 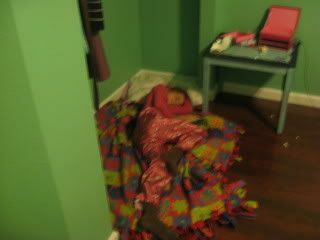 I was more concerned and amazed to see a made bed in a child's bedroom. In my experience, the two are mutually exclusive. In fact, I was under the impression that should the two ever come in contact with each other, the world as we know it would implode. I love this post,so,so funny! I have a card you should see. Will try to remember to scan it and email it to you (or to find a link to the artwork on the internet). Basically, it's a picture of a large cat lying on a bed with a human curled up beside it. The cat is looking directly at you and commenting: "Give them an inch and they'll take a mile". That is great. At least you know Eldest has a tender heart, right? Maybe not the greatest judgement, but a tender heart. Well it would certainly make sense in my house where the daughter went out and bught a queen size bed so the 2 cats would have enough room. LMAO!!!!! Yes, Dharma is a bed hog. 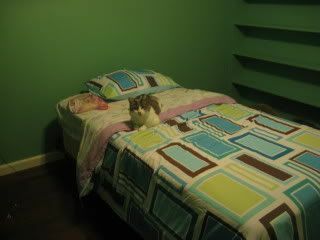 She used to protest quite loudly at night when she slept with me and I would deign to move. What do you think you're doing? Hold still! I'm trying to sleep! Now and then I'd have to toss her off my bed to show her whose boss. Tell Eldest it is perfectly alright for Queen Dharma The Cat of All Humans to sleep quietly at Eldest's feet and even more alright to toss her little bum onto the floor. And youc an tell Dharma her First-Mom said so! But I'm still laughing hysterically at this. Oh Dharma, my darling cat who I will adore forever, you are such a CAT!